General Description of Recombinant Bacillus Monomeric sarcosine oxidase Protein. Catalyzes the oxidative dethylation of sarcosine. 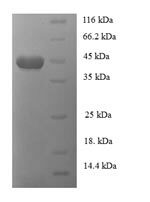 Host: QP7152 protein expressed in E. coli. Protein Construction: A DNA sequence encoding the Bacillus sp. (strain NS-129) Monomeric sarcosine oxidase, was expressed in the hosts and tags indicated. Please select your host/tag option, above. Application Notes: Please contact us for application specific information for QP7152.